Both pack sizes also contain all the vitamins, minerals and omega 3 that are needed to help meet your requirements. PKU air is the lowest calorie ready-to-drink protein substitute for PKU. Who is PKU air for? How much PKU air do I need? The amount of PKU air needed will depend on a variety of factors including age and weight. Your dietitian will advise exactly how much PKU cooler will be needed each day. How do I use PKU air? Remember water or other permitted drink should be taken straight after PKU air. What flavour is PKU air? PKU air is available in gold “coffee fusion”, green “citrus twist”, red “berry blast” and white “Caribbean Crush. You can choose your favourite PKU air flavour to take all the time or you can pick ‘n’ mix the flavours depending on what you feel like each day. What is the difference between PKU cooler and PKU air? PKU air and PKU cooler are both ready-to-drink, liquid protein substitutes which can be taken by children from 3 years of age. 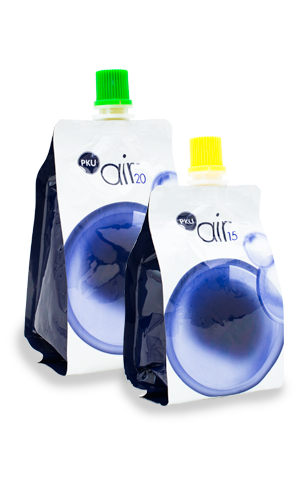 PKU air was developed after feedback from older teen and adults with PKU who wanted a liquid protein substitute that contained less calories than PKU cooler and was available in flavours that were more appealing to teens and adults. PKU air is a ready-to-drink liquid protein substitute which is great if you want something quick and convenient. If you prefer a powdered protein substitute with the flexibility to make to your own preference, then click on PKU express on the VitafriendsPKU product journey for more information on Vitaflo’s powder product. PKU air is a food for special medical purpose, and should be used under medical supervision.